Hard versus Softboots: Which Setup is Right for You? This month’s cover features splitboarder Mark Hartley descending a puckering face outside of Revelstoke, B.C. 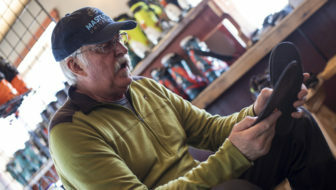 And Hartley, who proudly rips on a hardboot setup, is intimate with the debate between traditional, soft snowboard boots versus plastic-shelled alpine-touring ski boots. As Hartley puts it, that debate can be quite controversial. “Softbooters seem to see hardbooters as steezeless robo-stiffys with no style and no soul; techno weenies who may wear Spandex and might as well be skiers,” Hartley says. “Hardbooters see softies as sheep who use overpriced, cheap toy goods, which are barely suitable for mountain use.” The reality is that both are tools to access the places that we love to ride. The decision to use hard or softboots comes down to personal preference. But there are three key things to ask yourself before you make the switch. DO YOU WANT TO BE A GUIDE? 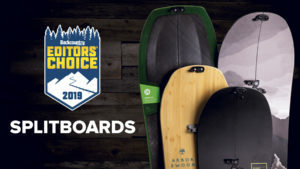 Both Layton and Hartley say hardboots provide the features that a guide/splitboarder needs to be successful in the backcountry. 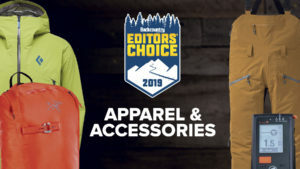 Those features include a narrow profile and better pivot point to provide more efficient skinning, crampon compatibility, easier split skiing, faster transitions, the ability to kick step with ease and waterproof shells to keep your feet dry during big missions. WHAT KIND OF TERRAIN AND CONDITIONS DO YOU RIDE? AND WHAT STYLE RIDER ARE YOU? Töelderer also mentioned that with all the advancements in softboot splitboard technology over the last few years, there is little reason to go full-on hardboot. This year boots like the Thirty-Two MTB and Deeluxe Spark XVe incorporate hardboot-like features, including a walk mode and waterproof gaiters, closing the gap between hard and softboots. 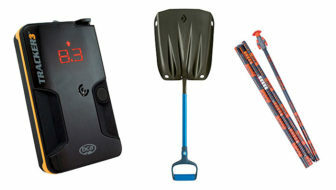 ARE YOU A GEAR JUNKIE WHO LIKES TO SPEND LOTS OF MONEY ON GEAR AND ENJOYS MODIFYING IT? 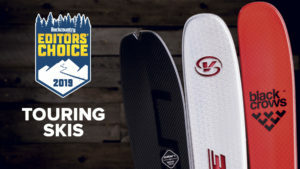 In addition to experiencing a longer break-in period, many hardbooters will modify their boots to increase the amount of flex they can provide to make them perform more like traditional snowboard boots on the descent. 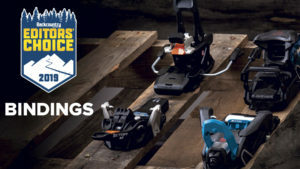 This can take time to figure out what works and requires cutting and drilling into your boot, which voids the warranty. Beyond modifying, the costs can quickly add up—Layton’s setup pairs Phantom bindings ($950) with Dynafit TLT6 boots ($750). Add on the Intuition Liners that many hardbooters recommend and you are pushing nearly $2,000. But for riders like Layton and Hartley, it is a small price to pay for the ease of backcountry travel that hardboots provide. This shouldn’t even be a question. 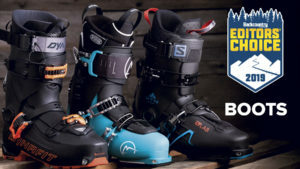 The best snowboard mountaineers in the world use soft boots. Why? Cause it’s called snowboarding. I’m sure Mr. Layton feels proud to be guiding in hardboots for a ski organization but I would never tour with a guide wearing hardboots. My big question is what crappy boots were these guys touring in before? I’ve never come home with wet feet and have no problem skiing in soft boots. I guess some people actually know how to snowboard. Obviously another person making assumptions about something they have very little experience with, pretty common on these comments strings anywhere on the web. 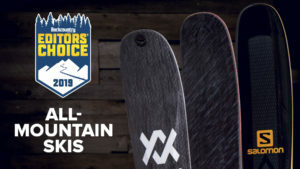 Funny I’ve never knew there was some list out there of the best snowboard mountaineers and which boots they ride on. I’d love to see that ranking system! Just recently I heard some people commenting about never wanting to tour with snowboarders in softboots. I’m fine with people who swing both ways. Dear Anton, “never” ah well then you will never reach truly into the Alpine. I have used both systems , a lot, and whilst there is some development to go on the hard boot side the advantages are huge. the wet feet point is rubbish and you are right, but the skinning efficiency is a huge plus. For any skins over an hour or on icey alpine wind blown the interface between the dynafit system and your foot is 10-20% more efficient when pushing the split forward. I have used both the spark R&D and the Phantom system. The Phantom is great for day tours but is not as mechanically robust as the Spark. 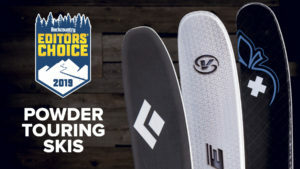 The hard system is really great on icey terrain as the edge hold is solid and positive, but if you are building kickers in the BC then the hard boot has less natural flow to the riding. However I will not go back to Softs for anything that may involve a long stay out or a multi day trip. I used TLT6’s on a 172 split Dupraz in Japan last year and it was very very good. It is harder to ride switch as the ankle flex at the moment in a TLT boot is a bit stiff unless you break out the knife, but when you do its a very good system. Never is a long time…..
What Kyle and Dinks said. They’ll eventually meet in the middle and a great and entertaining debate on sb.com will die. Absolutely. I’m waiting for the specific split board hard boot. Having witnessed my buddies uphill performance dramatically improve with hard boots I’m jealous but I enjoy the soft ride. Meet me in the middle. I think meeting in the middle would probably be the worst of both worlds. Its kind of like 3 in 1 coats… sure they do multiple things, but they kind of do a sh***y job at all 3 things. I’m guessing you wear a base layer, a puffy, and a shell instead of a 3 in 1 while splitboarding. Same philosohpy goes for hardboots. 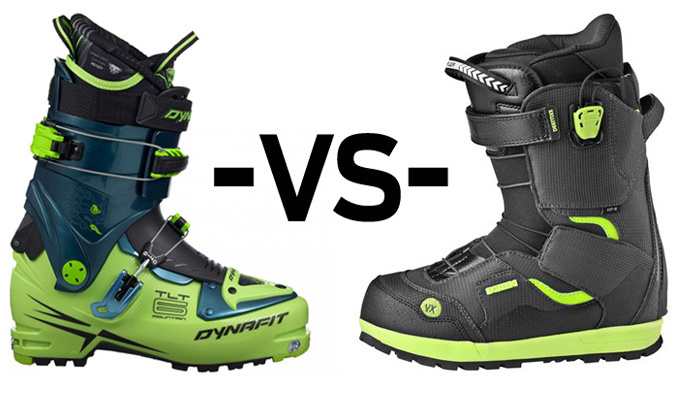 Plus, the Dynafit TLT6 really IS the split-specific hardboot. You don’t see splitters out on BDs or Scarpas. I think you should giv’er a go if you’re at all interested. NO ONE wants to kick steps in soft boots. If you should be using hardboots, you self-identify. Everyone else should stick to soft. 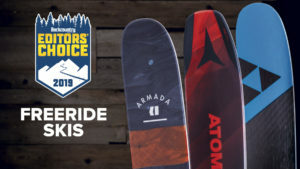 If you even think you might want a pair of hardboots, you owe it to yourself to check out all the latest and greatest softboots out there. I just picked up a pair of the Burton tourists and they are a revelation. I’ve been using my leather mountaineering boots (La Sportiva Nepals) and softboots (12 years old!) on and off for years, depending on where I want to go and conditions. Will have to check out the various rigs mentioned here, thanks. I tried both for years and am still trying to decide which I like best. Currently I have been using a highly modified pair of Scarpa Tele boots with Dynafit inserts in the toes so I can use Dynafit toe bindings for climbing and Spark Dynos for the riding. This combo is probably the most efficient I have ever used for uphill because the book flexes at the ball of my foot. The Spark Dynos are bomb proof and reduce board weight for the uphill climb. The ride down is a bit stiff, especially when the snow is firm. When using softboots (K2 Darkos) I use the Spark Magneto. A great combination for riding almost any condition, but a little sloppy for climbing. Quite impressed you manage to board in Nepal Extremes Les – I tried in mine and, whilst they are great on the heel edge, I had very little control on the toe edge due to the lack of shin support compared to a snowboard boot – on the plus side they take a proper crampon. Using my Burton Rulers on the split works well for board control but the lack of crampon use I found a problem at times – had to be picky about where I went for the day. Consequently I’ve just bitten the bullet and bought a pair of Fitwell Freeride Boots which, theoroetically at least, should give me the best of both worlds – will find out later this week when I go up to Fort William to give them a try-out! How has your experience with the Fitwell boot been? I’ve been riding 15 yeras with hardboots, but now, it’s finish. Try Fitwell Boots https://fitwellboots.com/, it’s a good alternative between soft and hard. I just change the inner boots, and put a Lange ski race inner boot. Great for walking, hiking, and perfect for riding. I’m making the switch from Soft boots to hard boots after many years of wearing nothing but softboots. Much of the split boarding I do has an ice climbing component involved. I’ve been using the Fitwells backcountry boot for three years and have climbed a lot of WI3 and and a little bit of WI4 with the Fitwells. I’m selling the Fitwells if anyone is interested. I’ll likely use the Spark Dynos. Hey Cam, how much the Fitwells? What size? Milton, My Fitwells are size 12 US and size 31.5 Mondo from Fitwell. Fitwell’s 31.5 Mondo is about the same size 30.0 from other companies including Dynafit. I’m not sure why Fitwells sizing is small but it us. I almost always wear a size 12 US mens and the Fitwells fit me perfectly. Feel free to call me at five zero three, eight nine three, zero one nine zero to chat or email me at camstorrs@gmail.com. We’ve compiled a database of U.S. resorts with a little about each individual policy—where and when skinning is allowed, whether or not it’s free during operating hours and the link directly to the resort’s guidelines.